Holy Cross is blessed with a wonderful variety of music and music groups - something for everyone. We are not about smoke, lights and big production but about making a joyful noise to the Lord no matter your musical background. 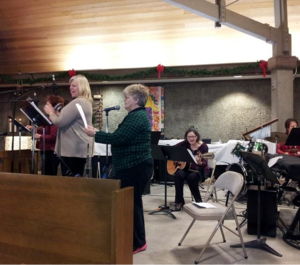 Often our services combine multiple styles/forms of music. Take a look at what we have to offer and find where you fit - either as an active music group participant or a joyous singer in the congregation! Do you enjoy singing the hymns and songs during worship? Then you have a place in the Chancel Choir! Please consider joining our happy group -- don't be shy! The ability to read music is helpful, but not a requirement. This season we will be singing a lot of unison anthems (where everyone sings the melody just like a hymn) or two-part anthems (with the men and women, for example, singing different notes). We'll be singing some very familiar melodies and learning a few new ones, too. We have lots of fun "making a joyful noise unto the LORD". We practice on Thursday evenings from 7:30 to 8:30pm, with usually one Thursday off per month. We sing on the first and third Sundays of the month, plus a few special services during Christmas and Easter week. Like the Bell Choir, we take the Summer "off" and start again fresh in September, with our season lasting until the third Sunday in May. Questions? Contact Douglas Peterson through the church office. We look forward to you singing with us soon! Young men and women bring a special vitality to worship. Good Tidings is our young adult worship band leading worship with contemporary Christian music. Practicing a few Sundays each month in the evening, Good Tidings leads worship the first Sunday of every month as well as some of our special services like Christmas, Easter or other celebrations. Ages range from middle/high school through college and young adult. Contact Chris Reynolds and join the beat! The Holy Cross Handbell (and Handchime) Choir is one of the most enjoyable and joyful worship groups. We have to concentrate a lot (if you watch closely, you’ll noticed that very few ringers smile until after a song is finished), and count all the way to 4 (sometimes the director is tough and we get a 6/8 song – Ugh.) We have more notes than a pianist has fingers, so we listen hard to hear the melody – that’s why we usually play songs that are familiar. On top of all that, it is a real joy to put it all together as a close-knit team that worships our Lord with this amazing music. Please consider trying the bells; it’s a worthwhile challenge. It’s quite a bit different than most of us expected, but once you "get the hang of it" it is really fun. Getting started is helped by having a couple separate "lessons" to get used to the way to swing the bells and how to see your part in the music. "Cheating" by marking notes is accepted, and counting out loud in practice is pretty essential, even for experienced ringers. It all turns out to be a wonderful musical teamwork experience – one that is really satisfying and rewarding. Besides, you get to make a new group of great friends. We practice from 7:30 to 9 PM on most Monday evenings in the sanctuary, and play for church services on the 2nd Sunday of each month (plus special days like Christmas and Easter. We take most of the summer "off", but we start fresh again in August and have planned a full season into June of ringing our Lord's praises. Included are songs like, God of Grace and God of Glory, The Lord Is My Shepherd (with piano), Advent Hope, and other familiar, uplifting songs. As you listen to familiar hymns of praise, consider joining the group. Individual training is offered (we all started from ground zero). It's an amazing team endeavor, making beautiful music even if we've never done it before. Questions? Contact Gene Eckert through the church office. We hope to hear you ringing with us soon. One of our more unique music groups is our King's Brass worship team. We have combined with brass musicians from a sister church to create a wonderful, diverse brass group. Practicing on Wednesday nights at 7:30pm, King's Brass helps lead worship on the 2nd and 4th Sundays each month and often provides additional music for special worship services. If you play a brass instrument, come and join our group. Contact Ed Lacina through the church office for more details. Contemporary Christian music is truly alive and vibrant today. One Voice is our adult contemporary worship team that leads through the use of new contemporary songs and sometimes old standards done in a fresh new way. The group practices on Thursday evenings twice per month and leads worship the 2nd and 4th Sundays, sometimes combining with either the Handbells or King's Brass. Another component of their ministry is mutual support and prayer at the end of each rehearsal. If Contemporary worship music speaks to you and you'd like to join with either your voice or instrument, contact Cynthia Fehrenbach, cynthiejune@yahoo.com. Nothing quite fills the Sanctuary like beautiful organ music can. Holy Cross is blessed to have two talented organists who provide music most Sundays - sometimes in concert with other music teams and sometimes alone in a purely Traditional worship service. The organ music leads the singing responses in litergy as well has the singing of hymns familiar and new. While we aren't looking for additional organists at this time, we welcome you to come and hear this wonderful music as we praise the Lord!